“Can’t change Washington from the inside” isn’t Obama’s surrender. It’s his declaration of war. Obama’s plea that he “can’t change Washington from the inside” isn’t a surrender. It’s a declaration of war. 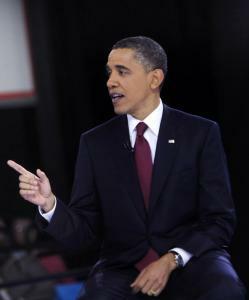 President Obama at the Sept. 20 Univision forum. Mitt Romney has found a way to change the subject from his disparaging remarks about 47 percent of Americans. He’s attacking President Obama for saying that Washington, D.C., can’t be changed “from the inside.” Romney wants to focus the presidential election on Obama’s statement. The fact that we haven’t been able to change the tone in Washington is disappointing. We know now that as soon as I came into office, you already had meetings among some of our Republican colleagues saying, “How do we figure out how to beat the president?” And I think that I’ve learned some lessons over the last four years, and the most important lesson I’ve learned is that you can’t change Washington from the inside. You can only change it from the outside. That’s how I got elected, and that’s how the big accomplishments like health care got done, was because we mobilized the American people to speak out. That isn’t a surrender. It’s a rallying cry. It’s a plea for outsiders—voters—to join the fight. Obama is saying his nice-guy approach didn’t work. He’s saying Republicans will cooperate only if voters send them a message. And the next message opportunity is on Election Day. One thing that I saw in 2008 is that when the American people come together and decide that they are going to fight for the values and ideals that made this country great, we can’t be stopped. … The work that we’ve done on education, on immigration, on housing, on putting people back to work, on making sure that small businesses have access to financing—those are all issues that are representative of what you care about, your values. But you’ve got to get out there, and you’ve got to make sure that you express that with your ballot. So I would urge you to vote, and I would ask you to vote for me and Democrats up and down the ticket. Democrats up and down the ticket. I can’t remember the last time Obama said something like that to a national audience. Why now? Because now he has the polls on his side. Look at the trend lines on the generic ballot question. This is the standard question that asks, “If the election for U.S. Congress were held today, would you vote for the Democratic candidate or the Republican candidate in your district?” Since March, Republicans have generally led or matched Democrats on this question, except for a two-week period in June and July when Democrats held an average lead of one to two points. That pattern changed on Sept. 10, when Democrats opened a lead that ballooned to three points—their biggest advantage in the Realclearpolitics polling average since 2009. Some of this is the Democrats’ convention bounce and has since faded. But the trend line shows no such bounce for the GOP after its convention. The Realclearpolitics U.S. Senate forecast reflects a similar shift. Since February, surveys have projected either a 50-50 tie or a Republican-controlled Senate. But this week, as polls turned against Republican candidates, the projection changed from a 52-48 Republican Senate to a 52-48 Democratic Senate. The trend could reverse again, of course. Now that some pundits are declaring Romney toast, Republican friends are tweaking me for having said that about George W. Bush in 2000. But one of my mistakes in that premature verdict was failing to appreciate the full universe of possibilities. One possibility now is that Romney and the GOP will recover. Another is that things will get worse for them. All year, we’ve been asking whether Republicans will take the Senate. What if we’ve been looking at the wrong end of the Capitol? If Democrats build an advantage on the generic ballot, could they retake the House? I doubt it, but I’ve been wrong before. And while a Democratic House would certainly help Obama, he doesn’t need that to make his point. An election-day purge of notable Republican congressmen, coupled with defeats in Senate races they had expected to win, would sober the GOP. The party that says foreign adversaries listen only to intimidation, not to Obama’s rational pleas, might develop new respect for the president’s agenda. If I were a Republican politician looking at the current generic ballot numbers, Hispanic voting trends, and long-term demographic projections, I wouldn’t be keen to talk right now about whether Washington can be changed from the inside. I wouldn’t want to spend the rest of this election debating whether Congress needs a clear message from the people. I wouldn’t be comforted to see Obama feeling confident enough in his lead and in his party’s poll numbers to ask for a Democratic mandate. That isn’t Romney’s perspective. He isn’t running for Congress. He’s looking for something, anything, to change the dynamics of the presidential race. And he may have found it. I’m just not sure the change will be what his party had in mind.